2011 UPDATE: The Microtrack II has been discontinued. Of our customers who purchased a MicroTrack II in 2008, approximately half wrote us to complain that their units stopped working after only 6-9 months of use. Based on our conversations with M-Audio Support, the problems appeared to be related to battery fatigue. Notwithstanding our customers' experiences, we were advised by M-Audio that there was no widespread issue with the MTII. Wingfield Audio has not had powering problems with its MTII demo unit, but the LED burned out after less than a year of use. Except for the classy darker color, the M-Audio MicroTrack II looks identical to its predecessor. Same layout. Same controls. When we first picked it up, we noticed that the MicroTrack II is a little heavier (5.5 ounces versus 5.3 ounces) and its sides are covered with a rubberized material, improving grip and handling. Very considerate. The "hand feel" of the MicroTrack II is very good. The most notable omission from this list is a compact flash card. Most other companies offer a token 128-512 mb-sized flash card to get you started. Seems like M-Audio could have done the same. 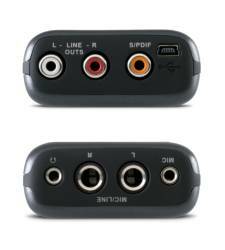 The MicroTrack II is easier to use than version I. The volume meters make level-setting much easier than it was with the little red and green lights. The formerly twitchy Nav Button is now fairly stable. The REC button can be programmed as a "REC PAUSE" button to avoid creating dozens of files while setting levels. The first firmware update was posted on 28 Dec 2007. The MicroTrack II battery does appear to be more efficient than the one in the MTI. It lasted more than 4 hours during our battery life test. The MTII Quick Start Guide contains an ominous warning that "failure to fully charge the MicroTrack II battery before first use can limit the capacity of the battery, lowering the total time of MicroTrack II." We charged ours overnight and haven't had a problem. The MicroTrack II accepts compact flash cards up to 8GB in size. 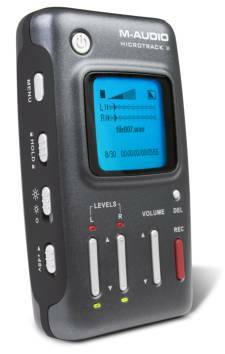 It has one of the most diverse arrays of inputs and outputs available in a handheld recorder. We can't figure out how M-Audio managed to get such good sound from the cheap little stereo 'T' mic that comes with the MTII, but they did. The MicroTrack II sounds very good with the little 'T' mic. The high-caliber sound quality is why so many people put up with its irritations. On the other hand, we had trouble getting clean sound with an external condenser mic plugged into the 1/4" TRS mic inputs. Is the MicroTrack II better than the 24/96? Maybe. To our ears, the MicroTrack II conveys a bit more spaciousness in its aural sound stage than its predecessor, but it is also a bit noisier. The MicroTrack II sounds very good with its little 'T' mic. 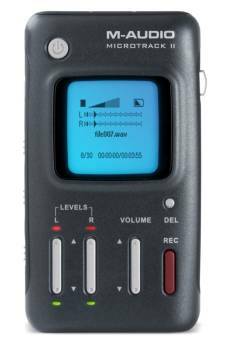 It is the smallest-sized portable recorder available that offers 48V phantom power.